Joelle Carter at the California premiere of "Unstoppable." 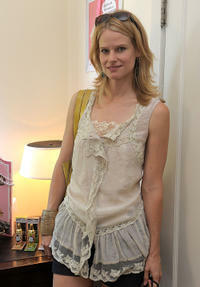 Joelle Carter at the Some Kind-a Gorgeous Style and Beauty Lounge in California. Joelle Carter at the premiere of "Justified." Graham Yost and Joelle Carter at the premiere of "Justified." Joelle Carter and Natalie Zea at the premiere of "Justified." Joelle Carter and Erica N. Tazel at the premiere of "Justified." Michelle Forbers and Joelle Carter at the premiere of "Wonderland." Joelle Carter at the NBC upfront. Joelle Carter and Michael Jai White at the premiere of "Wonderland." Joelle Carter at the party at QUO sponsored by the Gersh Agency. Joelle Carter at the party celebrating New York Upfronts with L.A. Confidential Hamptons & Gotham Magazines. An undated File photo of Joelle Carter.